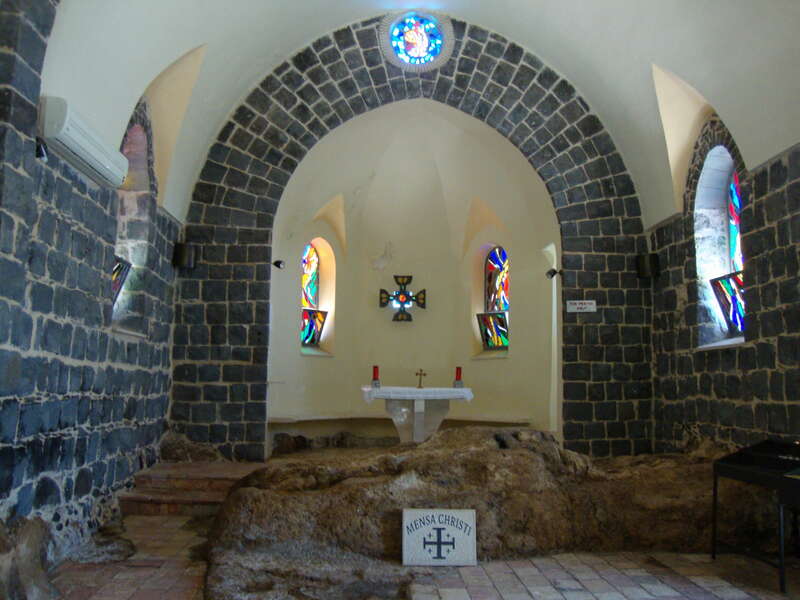 Further along the shore of the Sea of Galilee we stopped at the Church of St Peter’s Primacy. At this point Peter recognizes Jesus, and promptly jumps out of the boat to wade to shore to meet him. The other disciples follow in the boat, dragging the net behind them. When they land, Jesus has prepared a charcoal fire for the fish and provided bread, and they have breakfast together (John 21:9). This is believed to have taken place on the Mensa Christi (Christ’s Table), a large rock incorporated in the church – it is a striking feature and stretches across the entire width of the church. After breakfast, Jesus commissioned Peter as leader of the group and his church (after his three-time denial of Jesus at the crucifixion) with the words “Feed my sheep” (John 21:15-19); a bronze statue of Jesus symbolically commissioning Peter with his shepherd’s crook stands just to the side of the church. Just along from the Mensa Christi bay is an area which is a natural amphitheatre, and if you stand on the shore and speak, you can be heard further up the hillside and so you could understand how Jesus could have preached from a boat and be heard by the multitudes. As we walked along the shore – two rock hyraxes or rock badgers (mentioned in Psalm 104:18) were running along a path and seemed to take everybody’s attention and photos were taken left, right and centre. 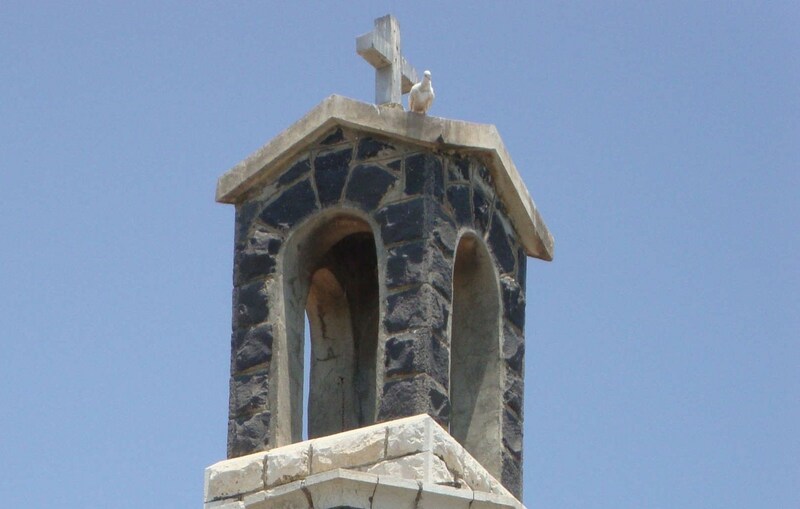 But I took none, because my eye was drawn to the cross on top of the church and the white dove perched beside it. And to me it spoke of symbolism – this time of Pentecost and the Holy Spirit descending on the whole church, and so the commissioning we had just heard of somehow seemed complete. (Remember you can click on the pictures to make them larger).